Why yes, I do wear black skinny jeans and an oversized grey sweater everyday. 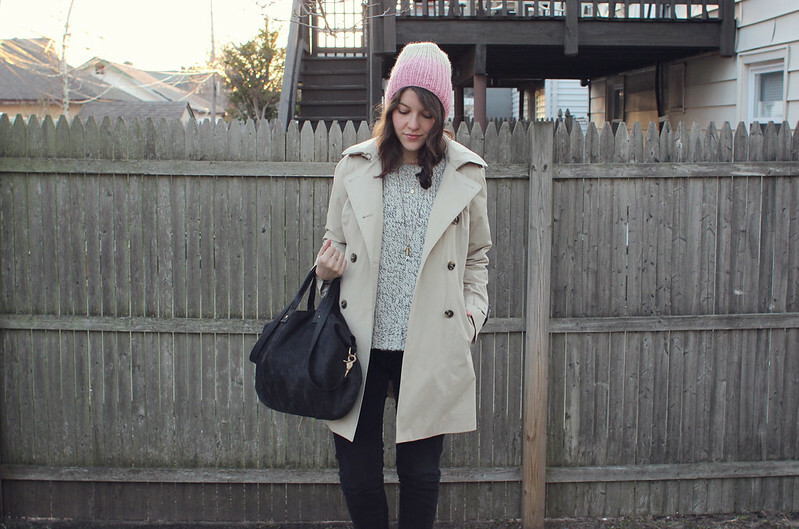 My favorite part of this look is my blush pink ombre A Wool Story hat made by the talented Meg Navoy. When I bought it back in early March I joked with her during the exchange that I needed a new hat since we were stuck in a never ending winter. Not far from the truth, I still need this hat every morning when I leave the house since Long Beach apparently hasn't gotten the memo that its almost May. Made from 100% pure wool Meg keeps costs low and creates no environmental impact by unravelling previously loved sweaters to make her one of a kind hats. I highly recommend following her on Instagram @megnavoy where she shares snippets of her fashionable life and interest in sustainability in the fashion industry. 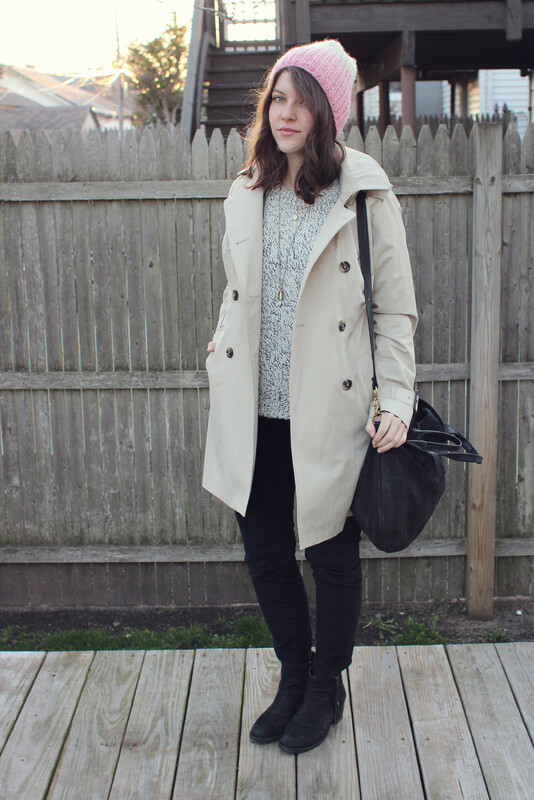 PS: Here's the elusive trench coat I told you about. But more on that later. Well black and grey are always chic so you can't go wrong with them! Love this look on you :) especially the pastel hat. Really want a cornflower blue one! Also, a strange question but how do you get your date like that on your blog in the corner? What a cool idea to make hats out of old sweaters! I would've never even thought that was possible which is probably dumb of me. I have no knowledge of knitting even though I wish I did! I love your adorable pink hat. Your trench coat is pretty awesome too. Very classic! You look lovely here, that hat looks gorgeous with your hair! 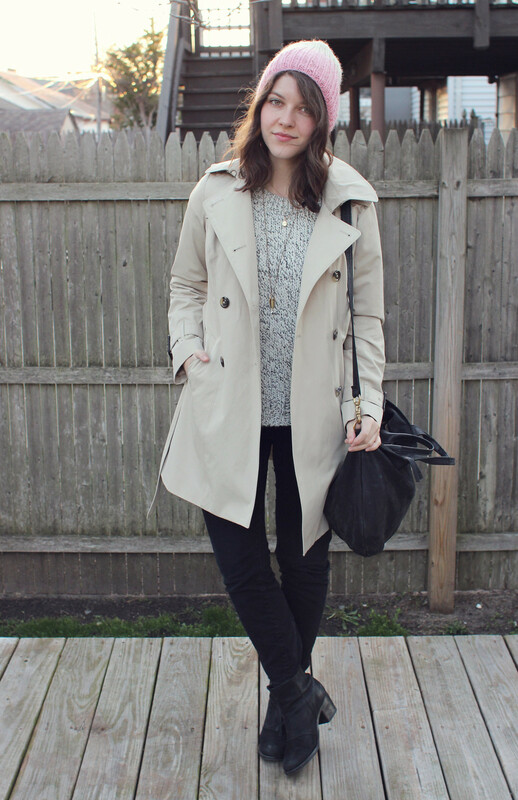 Loving that trench coat first and foremost Kallie!